Now that schools have broken up for the summer my thrifting will be down to a bare minimum, and even that will cost me dearly (in terms of time and sanity, not money, fortunately). We have an arrangement whereby for every charity shop I go in, my son gets to look in some horrible, boring game shop or similar. It's only fair. It would have been typical if the last morning I had free to check out my favourite charity shops had been disappointing, as it so often can be, but this week the thrifting fairies were kind to me. 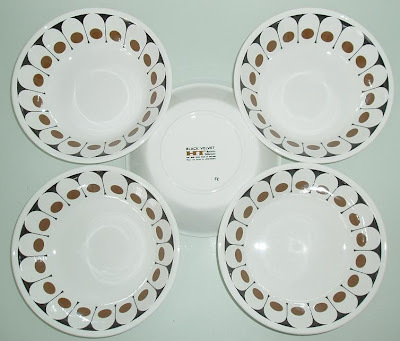 These awesome 1970s Hostess Tableware "Black Velvet" bowls appear to be brand new. They still have the corrugated cardboard stacking inserts. £1 for 5! 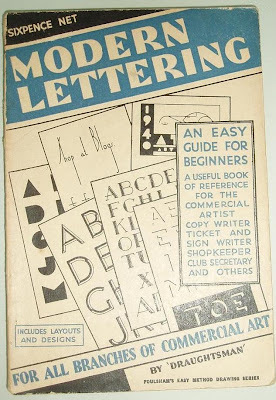 As regular readers of this blog will know, I love fonts, so I was really happy to find this old book for 50p. I'm guessing it's from the 1930s/40s period, and it's really not in bad condition considering. The pages are lovely, heavy, slightly textured paper, and the spine is in good shape, though you can kind of feel that it is a bit brittle and the pages might start to come out if it's handled too much. If this does happen, almost every page would look wonderful framed, so it's a win-win situation. I can't seem to get the dark purple of these 70s coasters to look quite right in a photo, but you get the idea. They are in good condition, and good quality, although I can't find anything similar in a Google Images search. They cost £1.50 for 6, and will be re-sold, as I can't stand purple! 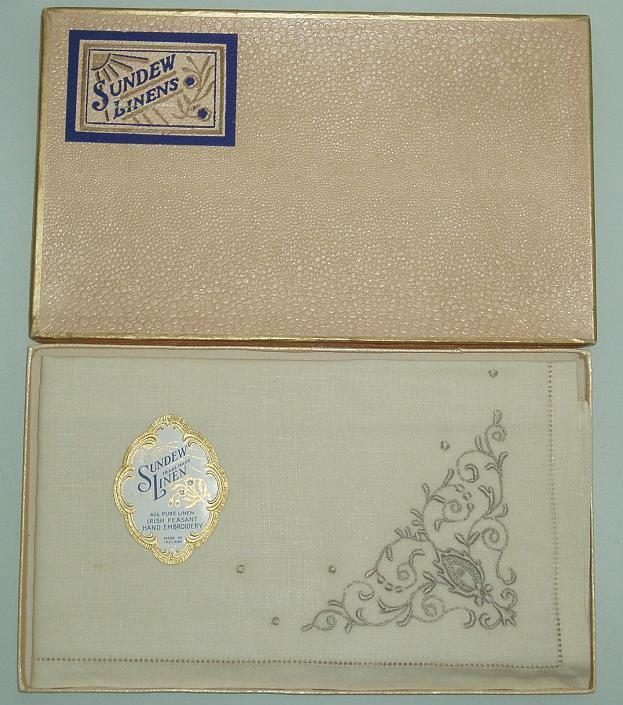 Just as I was about to finish my thrifting trip I spotted two ornate, textured, narrow boxes at the bottom of a pile of ugly sheets. 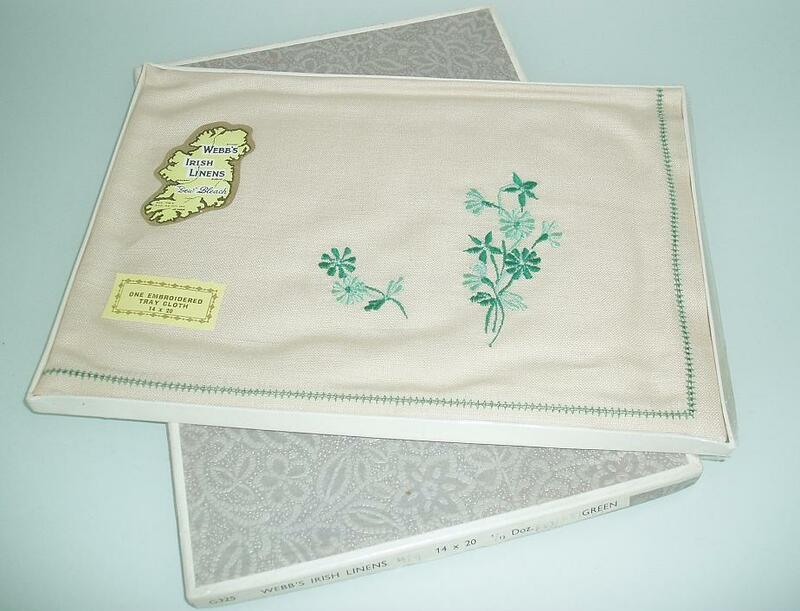 They were marked at 50p each, and each contains an unused Irish Linen traycloth. 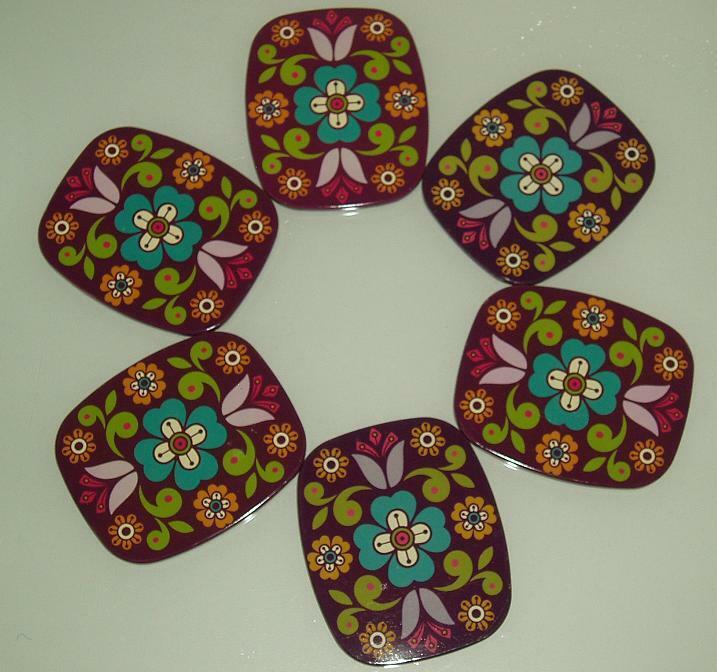 They will be for re-sold, as they are not my style, but they are very good quality and the boxes and labels are lovely, too. 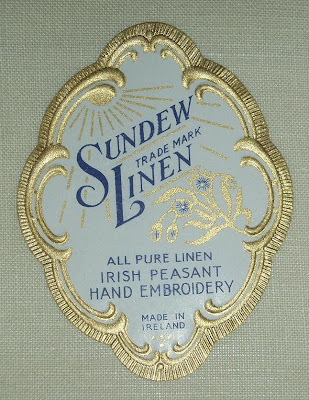 No idea as to the age of them, the Sundew Linens one looks 1930s style to me, the Webb's Irish Linens one seems newer, 50s or 60s, maybe? Look at this gorgeous label! 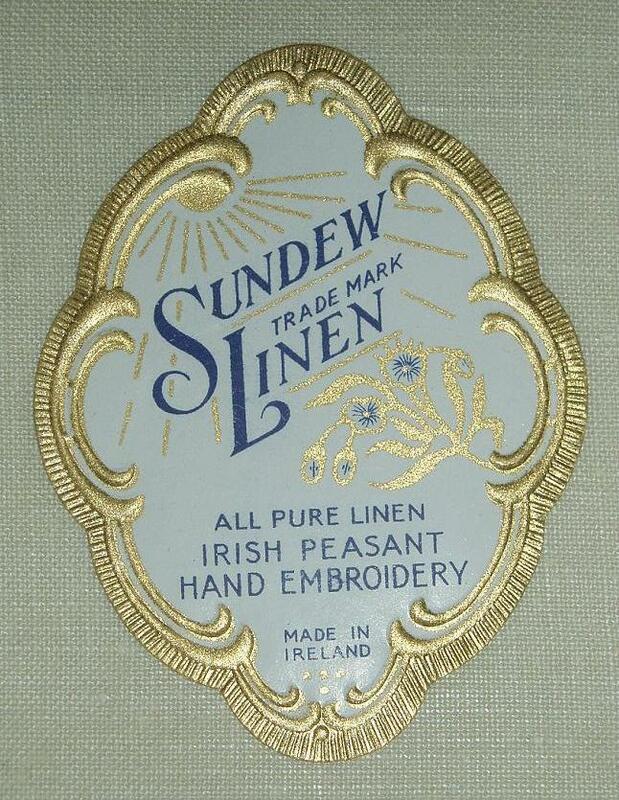 I really, really hope that the Irish Peasants were paid well for their work. Oh, by the way, the toilet door signs were 10p each. I may put them on the toilet door. I couldn't help thinking what fun could be had with them in a public building, though. For the rest of the summer I will be excavating my spare room, re-discovering past thrift finds and listing them on ebay, on the grounds that if they have been in a box for 2 years and I haven't missed them it's time for them to go. That's the plan, anyway. 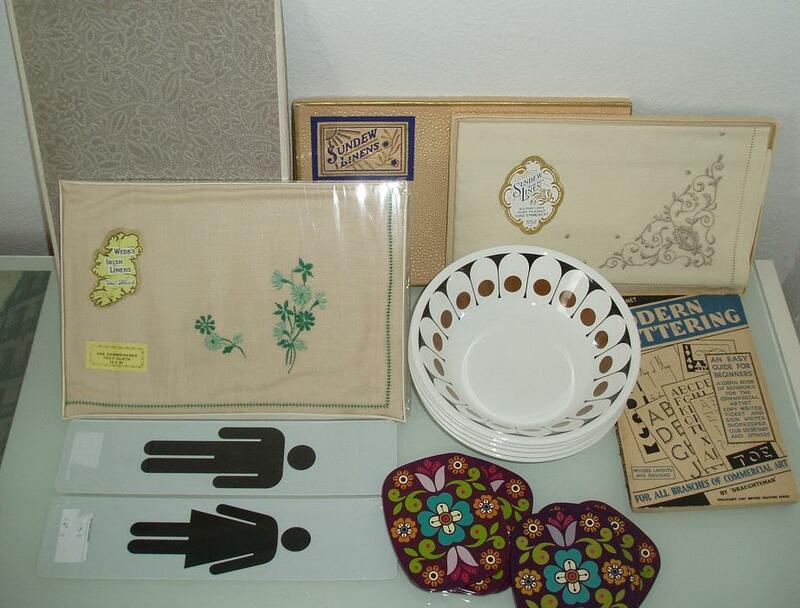 Wow, love your finds especially the coasters and those bowls. What an excellent idea to frame pages from your "Modern Lettering" book. I thought you were making it up about the peasants too! 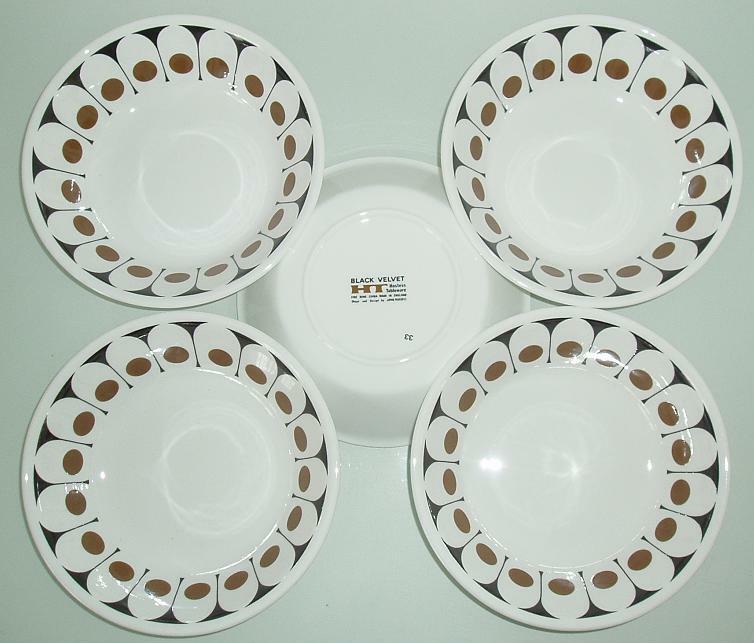 Love the bowls. Lovely finds! I will miss seeing your treasures. Thanks for all the lovely comments, I love to read them. I will still be blogging my thrifting finds, I have boxes of "unblogged" stuff in my spare room and it is my summer challenge to myself to sort them out. You are right, that label on the linens is fantastic! Not to mention the handiwork. I really admire old fonts too, we have much less variety in packaging these days, wouldn't you say? I love the linens! Great finds. 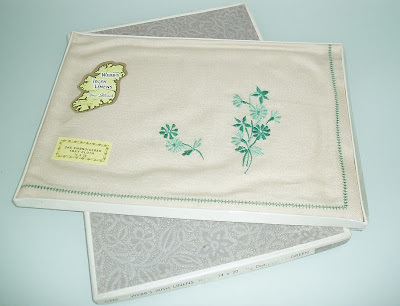 The linen tray cloths are beautiful and yes, the label is gorgeous as well. The font book is really interesting as well. You'll have loads of fun looking through that one.